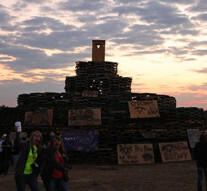 The Homecoming Week theme plays a vital role in one of Tarleton’s most honored traditions. Students build parade floats, organizations write their yells and Tarleton designs its official T-shirt based on the all-important theme. This year, Tarleton wanted students to take part in the process. Tarleton’s Homecoming Committee is made up of head chairman Darrell Brown, athletes, Plowboys, housing representatives, university police and student life representatives. Committee members asked students to write down their suggestions and submit them in the suggestion box in the Thompson Student Center or online now through OrgSync.